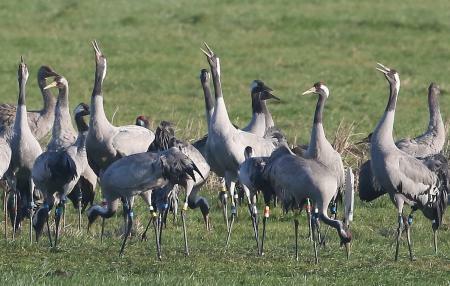 I am delighted to announce that some of the cranes released through the reintroduction project have raised their own chicks to fledging. This is the first time cranes have produced their own fledged young in the South West for over 400 years - quite an achievement! A 'hole' lot of work has been going on in Somerset over the last few weeks with contractors creating some areas where we hope, one day, pairs of cranes may breed. 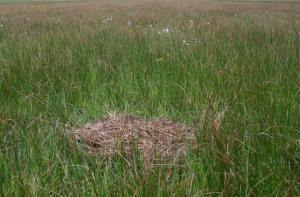 Sadly - it would appear that so far - this year's crane nesting attempts on the Somerset Levels and Moors have not produced any chicks. Lovely sequence of shots taken on Saturday morning by photographer and RSPB volunteer John Crispin. 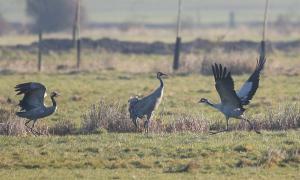 Despite the cold frosty mornings, signs of Spring are all around and quite a few pairs of cranes are starting to form here on the Somerset Levels and Moors. End of an Aussie era. 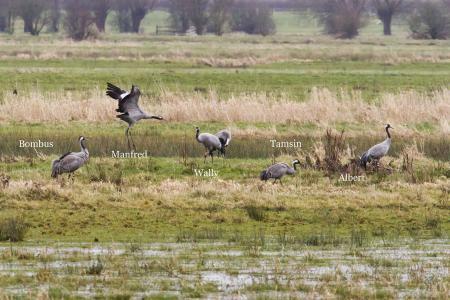 The cranes have been mostly on Wetmoor in recent days... best viewed from the public footpath that runs along the South side of the River Yeo to the East of Langport.